Fans of Ocean's Eleven, or die-hard Elvis Presley fans, will pick up on this IGT online slot's title straight away. Taken from Elvis's 1968 hit, A Little Less Conversation, this slot sets out to offer its players a little more action too. But does it deliver? A 5 reel, 50 payline game, the betting is a little on the steep side, starting at $1 per spin, so with 50 paylines possible, big spenders should enjoy this slice of Vegas cool. It's called 'A Little More Action' for a reason, I guess. However, the $5,000 jackpot in the base game should ensure plenty of interest. I know it certainly drew me in but I am a sucker for the bigger jackpots! If you're looking for cartoon melons, animated monkeys or expanding cobras, look elsewhere - this slot is all about Elvis, Elvis, Elvis. The symbols, other than the familiar 9-through-Ace poker cards, are made up of Elvis singing, Elvis gyrating, even Elvis sat on the toilet holding a deep-fried peanut butter and banana sandwich. Ok, maybe not that last one, but you get the idea. The titular song interjects during the game, but annoyingly cuts out when you win as celebratory cheering comes in. It does get a little annoying, especially if you just want to hear Elvis on in the background while you're playing. One cute touch, however, is that a jangly Elvis guitar sound comes in whenever you change the betting and pay-line options at the bottom of the screen. The big Elvis neon sign acts as the slot's Wild, and substitutes for all symbols other than the Elvis Gold Disc bonus symbol. Five Wilds bags you the jackpot of 1,000 coins. That's pretty attractive, especially as I found the Wilds popping up quite regularly. Expect some pretty decent stacked Wilds too. There's 255 Free Spins Up for Grabs! The game's big bonus, however, is the Action Free Spins Bonus. Look out for the bonus symbols on reels 2, 3 and 4. If you get three of these then the famous song will chime in to reward you with five free spins. Not only that, you'll get enhanced bonuses on the reels, including extra stacked Wilds and bonus symbols. The free spins can be re-triggered too, meaning you can bag up to 255 free spins in total. That's about it for bonus games, however. It might have been nice to have a bonus round which features you trying to pick out Elvis's favourite midnight snack of choice, but that probably got left on the cutting room floor of IGT's development team office. 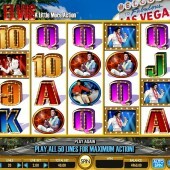 Elvis is a perfect theme for a slot. He's cool, he's Vegas all over, and that's what slots playing is all about. If not exactly setting the world alight on the game front, it certainly puts you in the Vegas zone. 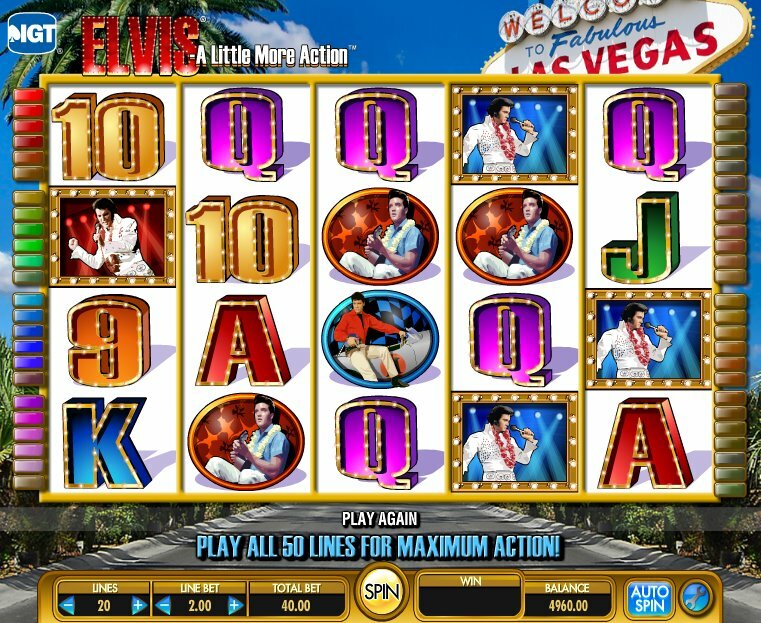 If you're in the mood for more Elvis nostalgia, and like your games a bit different, check out IGT's other King-themed slot, Elvis Multi-Strike, with its innovative three-in-one slot element. Hunting elsewhere, take advantage of another IGT Elvis fanfest, Elvis: The King, a slot that features not one, but three different bonus games, each one related to a different Elvis Presley song.